On Monday 13 November, Jupiter embraces Venus in Scorpio. Get ready for passion, excitement, and deep emotional + spiritual revelations. Love + partnership planet Venus is intense in Scorpio, but not exactly comfortable. Venus in Scorpio is the wife who asks you if you really were doing OT last night and not hanging with the guys. The hottie you just met on Tinder who seems promising until you discover he’s been stalking your old Angelfire website from ten years ago. The once-BFF who’s becoming almost a burden with her constant meltdowns. Jupiter, the “You want fries with that?” upsizer of the cosmos, amplifies the passionate/obsessive love-hate vibes of Venus in Scorpio. This is a great week for those of you who are into that kinda thing. For the rest of us who prefer peaceful lives, focus on the creative + aesthetic energies of Venus instead. Venus rules art and beauty – if you’ve been feeling a little burnt out recently, take some time out for a stroll in a museum or art gallery. Take out your paintbrushes, your old guitar, your neglected journal, and create something new from the wellspring of your soul. Scorpio is a fixed Water sign. For those of you feeling emotionally worn out, spend time near (or in) bodies of water – reservoirs, lakes, rivers, seas – to rejuvenate your body and spirit. And it’s okay if you can’t make the trip – treat yourself to a luxurious bath or a leisurely hot shower. sometimes you just need a good cry. Go ahead – tears are emotional detox for overburdened souls. Dig deep, feel your feelings, release the pain. 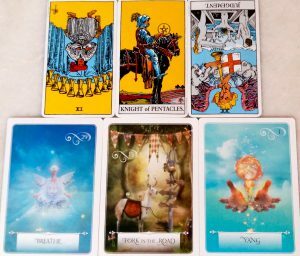 Let’s get to this week’s Tarot & Oracle reading! LEFT: NINE OF CUPS REVERSED. Remember the obsessive energies of this week that I mentioned earlier? The reversed Nine of Cups is exactly that: a focus on what we’re missing instead of what we already have. Allowing ourselves to fall in the trap of I’m not enough and I don’t have enough, two incredibly dangerous and false beliefs that drive us to self-sabotaging behaviours. you are enough. Take effective, ethical action, and you will have enough. Choose joy and contentment. leave the trap of self-inflicted suffering. The Tarot offers you a heads up so you can avoid these perilous pitfalls. Keep reading. MIDDLE: KNIGHT OF PENTACLES. One step at a time. The Knight of Pentacles is a strong advocate of addressing one’s challenges in a practical, methodical manner and at a steady, measured pace. Sir Pentacles is the only Knight in the Tarot who is depicted as standing still, reminding you to ground yourself and stand your ground (he represents the Earth element, after all) – and not allow yourself to be carried away by false fears or illusions. Ground yourself. Stand your ground. You are stronger than your fears. greater than your obstacles. Smarter than your problems. You are all you need. You are enough. it’s time to take right, effective, major action. BE BLESSED: BREATHE. Your blessing this week will be your discovery that you have the power to take time out for a breather. You probably know by now that trouble really starts when you allow external pressures to destabilise your inner peace. Learn to say No. Learn to pause. Then go somewhere quiet where you won’t be disturbed… and breathe. Close your eyes… just breathe. Regain your internal equilibrium; reconnect with yourself. Do not allow the world to rush you. Do not allow YOU to rush you. In traditions and cultures all around the world, Spirit is associated with fresh air. Deep breathing oxygenates your blood, restores your energy, and raises your vibrations so you can better access your intuition, your Higher wisdom, and the Divine. Claim and reclaim the blessing of breath as a means to connect with Spirit, as often as you need to. BE CAREFUL: FORK IN THE ROAD. When this card appears in the warning position, its energies are very similar to Judgement in reverse. Remember that Spirit often uses repetition to drive home a point, and pay attention! If you’re at a fork in the road and you need to make a decision, be very clear what your intentions are. Get all the information you need, and make a decision that aligns both with your mind as well as your heart. For some people reading this, I have a feeling this isn’t the first time you’ve arrived at this very same crossroads; for some other readers, it feels like you’ve been stuck here for a while. What, then, to do about this? Our final Oracle card has the answer. There’s a verse in Scripture which states: Faith without works is dead. In modern-day English, it means that your beliefs + spirituality require action to back them up. Strong emotions, spiritual breakthrough, a firm resolve – all these mean NOTHING until you take right, effective, major action to make things happen. Some of you might need to end a dysfunctional relationship. Quit a toxic job or habit. Pursue a passion (or a person) you never had the guts to. Forgive and move on from a deadlock. Some of you might need to speak with a counsellor or therapist – crossroads are difficult places, and you’ll need all the help you can get. Be brave, and be blessed.